What is the Best Way to Clean a Hot Tub Filter? - Leisure Time Warehouse | Hot Tubs, Swim Spas, and Pools. Ohio's Best Dealer! What is the Best Way to Clean a Hot Tub Filter? Part of enjoying your dream spa or hot tub is knowing that you are relaxing in a clean tub. A clean filter helps maintain water, clean filtration, and keep your heater up and running smoothly. So, how do you know if you need to clean the filter in your hot tub? Well, if your pumps are having difficulty keeping the water clean, if water flow is low or has failed, and possibly the heater is not operating – you need to clean the filter. You might receive a message on the control panel that details the mentioned, it might be indicated by “HL” “LF” “Dr” or “Dy”. If you see any of the mentioned indications- it’s time to clean that dirty filter. To clean your hot tub filter, you’ll need a garden hose, a 5-gallon bucket, a filter cleaner, and a towel. Make sure the power is off in your hot tub. Turning off the power ensures that unwanted items and debris don’t make their way down the filter fitting, which can cause greater problems. After you make sure the power is off, take the filters out. Number of filters range from 1-3 within the tub. Remove any debris from the filter and then spray the filter with your garden hose, this knocks free any dirt or grim clinging to the filter. Now, grab your bucket and pour in the recommended amount of cleaning agent and at the same time diluting it with water. Once the bucket is filled, add in your filter and let it steep and soak overnight. Once the filter has thoroughly soaked overnight, remove it from the bucket. Rinse the filter from the cleaner with water from your garden hose. Leftover cleaner in the filter can result in it foaming up in your hot tub. If you have an EcoPur filter, it can be simply cleaned by just rinsing with water. These filters should be replaced about every 6 months. Whereas regular filters are to be replaced once every year. Cleaning your hot tub filters is an important step in its maintenance. How often you need to clean the filters depends. If your hot tub has been filled up recently it’s good to clean the filters within 2-3 days to eliminate any impurities from the water. If your tub is used quite frequently then it’s good to clean the filters more often. If you’re not sure, it’s good to clean them about once a month. Once thoroughly rinsed, filters then can be properly re-installed and your spa is ready to be used again! Enjoy! A clean hot tub begins with a clean filter. 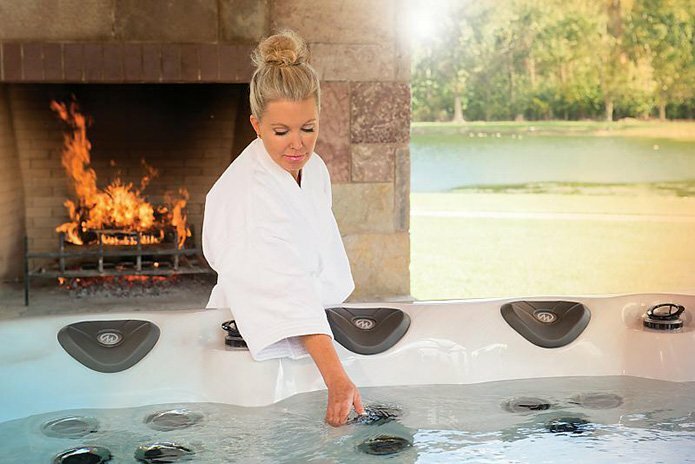 LeisureTime Warehouse has all of your swim spa and hot tub supplies including the EcoPur filter, that help keep your hot tub experience perfect every time and will help you save on water usage and energy. As a luxury brand swim spa and hot tub retailer, we are confident you can find the hot tub of your dreams. Our products offer quality features and performance and we’ll do our best to help you find the perfect tub that meets your needs. For example, do you want the hot tub to relax after a long day, to have fun with your significant other, or to work on health benefits? Contact us today to learn more about our amazing products!